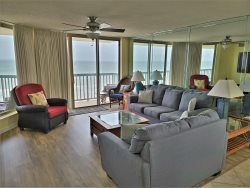 With incredible coastline views, attractive decor, and lots of amenities, this 3 bedroom condo at Seaside Resort is a wonderful choice for your vacation. Enjoy the Ocean Drive Difference by starting your vacation immediately upon arrival, as this property comes with fresh bed linens/bath towels, the beds are already made up for you, and the departure maid service are all included in your price. Seaside features a modern look, attached parking garage, oceanfront location, and fantastic amenities like indoor and outdoor pools, hot tub, lazy river, sun deck and fitness center. Unit 1201 offers comfortable accommodations with its two king and two queen beds, 2 full bathrooms, fully equipped kitchen, and cable TV. A large balcony is accessible from the master bedroom and living room, and makes an excellent vantage point for sunrise watching and ocean gazing. A guest bedroom has great views of the surrounding Crescent Beach neighborhood. Getting onto the beach is no problem; Seaside has a private beach access complete with outdoor showers. Enjoy endless dining options, nearby golf courses, and Myrtle Beach's famous attractions and shopping, just minutes away. Call today to book your stay at Seaside Resort 1201. You'll want to come back year after year! Seaside Resort is a modern, mid-size resort property in the Crescent Beach section of North Myrtle Beach. Enjoy modern decor, premium amenities, and great ocean views when you vacation at Seaside. An outdoor pool and sundeck, indoor pool, lazy river, hot tub, and updated fitness facility are offered with all rentals.